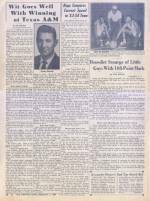 Harry Lancaster was Rupp's chief recruiter from the mid forties untill he was named AD in 1968. 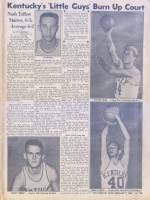 When Lancaster reccomended 6'4" Louisville Flaget center Ted Deeken in 1960, many thought it to be a big mistake. This season though, he was a key forward for UK, averaging 18.5 ppg. Rupp used his first zone at UK this season. It was a 1-3-1 that Lancaster had taught to Conley, Kron, and company the previous year on the freshman team. Nash made All America for the third time. This team was rated as high as #2 in late December, but finished the season with 2 NCAA tournie losses. 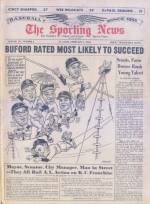 The Sporting News featured the 1963-64 Cats in their February 1, 1964 edition.